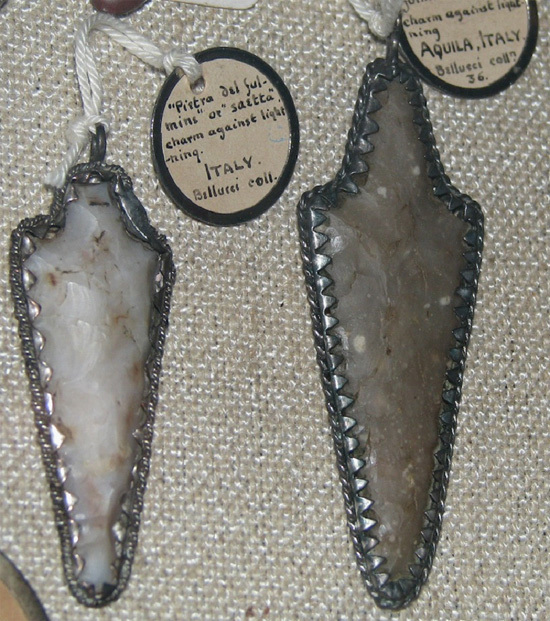 ‘Thunderstones’ in the form of prehistoric flint arrowheads, silver-mounted as amulets to protect from lightning. Italy (date unknown) Courtesy Pitt Rivers museum, Oxford, United Kingdom. The thunderstone is familiar from the folklore of virtually every culture, but plays no ‘roll’ in the serious sciences. In the eyes of most, the proposition that thunderbolts deposit rocks is an asinine artefact of superstitious belief – an antiquated theme that epitomises an infant stage in the intellectual evolution of the human mammal. But has this neglect of common folk traditions hit rock bottom with such swift dismissal? The conviction that no stones come down in the lightning hails from the same period when scientists proscribed the fall of meteorites – the 18th century, when Aristotle’s fiction of an immutable and unpolluted sky still commanded sufficient clout to veto the descent of any rocks from the heavens at all. As meteorites have long since gained recognition, the thunderstone deserves renewed attention, too. Upon inspection, the ‘thunderstone’ appears to be a mixed bag, as no less than five categories of objects have been thus labelled in traditional societies. These are the following, each illustrated with a smattering of examples. Peasants in southern and central Italy used to class ‘globular stones and especially all black stones’ as thunderstones. The Chukchi (northeastern Siberia) viewed obsidian as ‘the stone of the thunder, which falls from the sky in round balls’. And Inca diviners treasured ‘pebbles’ which ‘the Thunder gave’ to them. For centuries, locals of the Siwalik Hills (northern India) have collected fossil bones, which they dubbed bijli ki har (‘lightning bones’). Specifying a mythological context, some Sioux (Dakotas) ‘imagined that the large boulders on the northern prairies were the spent ballistics of the Water Monsters, hurled up at the Thunder Birds who struck back with lightning.’ What they dubbed kangi tame, bolts of lightning which have turned into black stones shaped like spear points, may really be pointed belemnite fossils (order Belemnitida). And in parts of Denmark and southern England, fossil sea urchins (class Echinoidea) passed as thunderstones. A meteorite presented to the Chinese emperor in 660 CE was called the ‘stone axe of the thunder god’. And whenever a meteorite was found, the contemporary Maya at Valladolid (Yucatán, Mexico) would recognise it as the arrow-points of the Yumtšakob, the storm gods who announce their coming in the thunder and lash their horses with the lightning. The early Chinese were wont to connect tektites to sudden rainstorms and thunder. Among the Cantonese on the island of Hǎinán, ‘star excrements’ was a term that referred to tektites, while other Indo-Malaysian tektites have been called ‘thunder dung’. In all of these cases, the tektites belong to the Australasian type. This typology of ‘thunderstones’ may serve as a bedrock enabling a judicious discussion of theories to explain the origin of the incendiary idea that the lightning yields rocks. As the term ‘thunderstone’ was applied to such a diversity of objects, a variety of rationales may have conspired to produce the single notion. These will be explored next.